Sitting outside the Visitor Information Centre in Wetaskiwin standing solid is a large stone and concrete memorial. This memorial called the Peace Cairn is a reminder of the colorful history of Native Tribes of long ago. The name Wetaskiwin gets its meaning from events that happened on the sand hills that border Wetaskiwin’s north and west sides about 146 years ago between warring Indian tribes. The Cairn was originally erected in 1927 as part of Wetaskiwin’s celebration for Canada’s Diamond Jubilee and to mark 60 years of peace between the Cree and Blackfoot tribes. The dunes of the Peace Hills region were formed by northwest winds blowing sand from glacial Lake Malmo at the end of the last Ice Age. The lake which covered the Wetaskiwin area dried up about 8,000 years ago. Archaeological evidence shows that these sand dunes were used by humans regularily over the past 8,000 years. Broken tools, bones and other artifacts helped to reconstruct the history of the site. 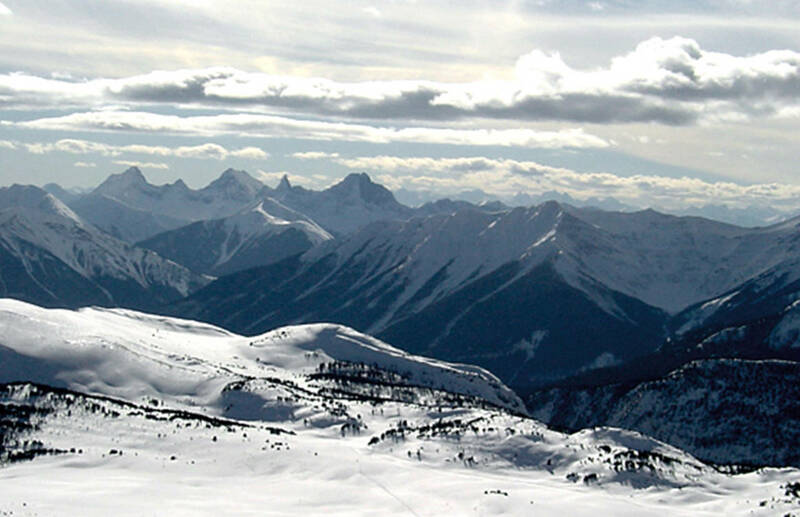 In fact this area is one of the oldest continually habituated areas in North America. These hills offered advantages to ancient hunters such as high spots to track game and enemies, and also close access to sloughs for water that still exist today. Buffalo were plentiful although the bones of moose, deer, beaver and wolf have also been found. In the 1800s the hills just north and west of Wetaskiwin were inhabited by large Native camps. At this time battles were common between the Cree of northern Alberta and the Blackfoot of the south. The Red Deer River was the dividing line and generally respected by tribes however there were a lot of encroachments. The Blackfoot did not always respect this and in the summer would follow the buffalo as they headed north in search of better grazing. The Blackfoot would raid Cree camps and drive off their horses. Warfare between the aggressive Blackfoot and the Cree had gone on for ages. According to oral tradition in about 1867 the Cree had a young chief named Little Bear and the Blackfoot a young chief called Buffalo Child. These two chiefs were respected and adored by their tribes. In the eyes of their people there was “no one stronger, faster, braver, or had more scalps to their credit”. The two chiefs had never battled each other face to face. Things would change late that summer. A large party of Blackfoot had been raiding Cree territory and had made camp on the banks of the Bigstone Creek. A battle was eminent as the Cree gathered. The Blackfoot could hear war drums pounding in the distance as their chiefs held council on what to do. The Blackfoot now boxed in by the Cree who had gathered in large numbers to the south, decided to stage a surprise night attack. It was not the Blackfoot way to run from a fight. The Blackfoot threw his rifle down and taunted his adversary “dog of a Cree, I throw my gun down and will break you in two with my bare hands”. The Cree threw his knife in the bush saying “no Blackfoot with the heart of a woman will get the better of Little Bear”. They circled each other like two wolves spitting insults at each other, finally locking into death grips. For almost an hour they struggled evenly matched silent except for heavy breathing and the sounds of nature as the sun sank in the sky. As exhaustion drew near both men stopped as if by some divine intervention. Sitting in the grass facing each other they vowed to continue after a rest spent warily eyeing each other. The Blackfoot pulled some tobacco and pipe from his bag and began to smoke. Little Bear did the same but found his pipe was broken. Little Bear was upset by this and with sullen eyes watched Buffalo Child puff away. Buffalo Child could see Little Bear was upset and appreciated this form of torture he held over his opponent at that moment. Suddenly as if by impulse Buffalo Child handed the pipe to Little Bear who took it immediately and drew deep into his lungs and let it exhale with contentment. Midway through he stopped and with startled looks the wide eyed chiefs looked deep into each other’s eyes seized by the moment. They had realized what just happened. By smoking a common pipe together they pledged friendship and peace which was according to tradition unbreakable. Reluctantly both chiefs knowing they did not mean to do it realized they had to go tell their people that “some great medicine must have been at work. It must be the will of the Great Manitou”. The following morning runners were dispatched from the Cree to the Blackfoot to summon a council. “The older chiefs listened gravely to the incredible tale and admitted what was done could not be redone”. To Indians tradition was very serious and you did not mess with it. On the same spot where the two chiefs had fought, four Blackfoot chiefs and six Cree chiefs, squatted in a circle and smoked a peace pipe vowing eternal friendship and peace. Ever since that the group of hills where this took place has been called “Wetaskiwin Spatinow, the place where peace was made”. 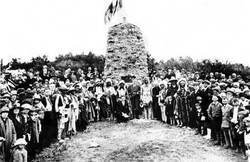 60 years later in 1927 the Peace Cairn was erected as a memorial for that day the two tribes made peace. School children carrying rocks walked to the hills overlooking Wetaskiwin on the side of the old Calgary/Edmonton Trail. Rasmus Sorenson who owned a brickyard and concrete business at the time built the Cairn using the rocks the school children carried as well as a curling stone donated by the manager of the Montgomery Department Store. The Cairn was dedicated on the morning of July 2nd 1927. A large crowd was present for speeches by Mayor Montgomery and historian John Blue. “Indian chiefs Ermine Skin, Bull, Sampson and the chief of the Montana band along with a number of their followers came galloping up the trail to add some color and realism”. They each addressed the crowd through interpreters. In 1980 the Cairn was moved to Centennial Park. On July 2006 as Wetaskiwin celebrated its 100th anniversary the Cairn was moved again and rededicated to where it presently sits at the Visitor Info Centre.